The concept “fintech” has gained momentum over the past number of years. More recent developments include the issue of the report on the implications that Fintech will have on global financial stability by the Financial Stability Board (FSB) during July 2017. Technology-enabled innovation in financial services (fintech) has with its emergence created risks and opportunities which policy makers and regulators should consider, and of which many have been attending to. Amongst other things it will impact how business models of start-ups and the market structure in general will be affected. The approach adopted by the FSB is one popular with many regulatory authorities, which is to classify fintech innovations by its respective economic functions and activities steering away from attempts to endeavour to create frameworks based on the underlying technology and its regulatory classification. Activities included within the approach of the FSB are fintech credit, wholesale payments innovations, robo-advisors, artificial intelligence as well as DVC’s. Effectively it is technologies used and applied within the financial services sector which is predominantly employed by financial institutions. More so, it is being understood as technological disruptors of traditional financial services. Fintech is also used to describe a wide variety of business models and emerging technologies which has the potential to transform the financial services industry. Other definitions in reference to fintech simply points to the use of technology to deliver financial institutions. At its broadest level however the term basically reveals the application of technology to finance. 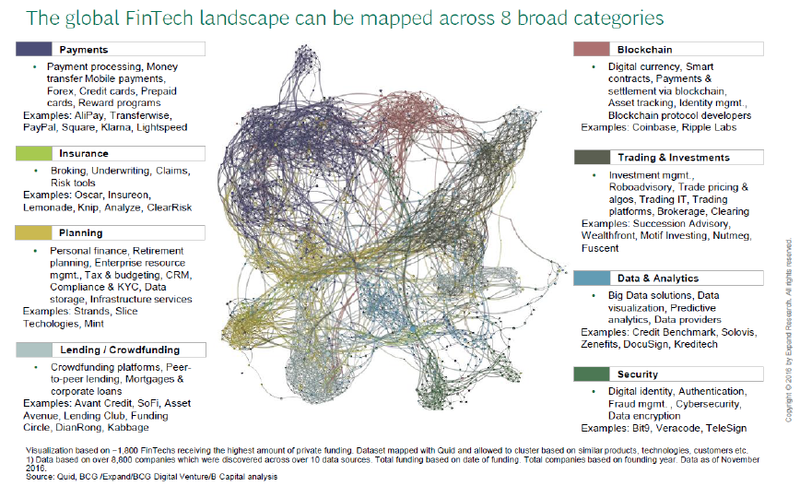 The global fintech landscape was recently mapped across eight important categories reflected in Figure 1 below as payments, insurance, planning, lending and crowd funding, trading and investments, data and analytics and security. The vast amount of categories impacted by fintech provide some insight as to not only its expansion over the past number of years but more so the understanding of how the existing financial system or structure seems to be impacted thereby. Since 2008 global investment in fintech ventures or start-ups have increased significantly surpassing $12 billion in 2015. During the first and second quarters of 2017 global fintech investment has more than doubled on a quarter-over-quarter-basis to more than $8.4 billion according to KPMG’s quarterly Pulse-Of- Fintech Report. This indicates a continued interest in investment within this sector revealing a portion of what one can expect from the near future if the trend persists. Based on the rate of adoption globally by digitally active consumers who use fintech, a benchmark of 33% of users were found to have adopted such services within the 20 markets surveyed by Ernst & Young in their 2017 Fintech Adoption Index. For emerging markets this percentage on average increases to 46%. Respondents to the 2017 PwC Global Fintech Survey (PwC Survey) expressed the view that fintech has evolved from start-ups wishing to enter a market and take on and surpass other incumbents to an extended ecosystem of businesses wishing to enter partnerships. The PwC survey furthermore suggests that regulatory uncertainty has increased both for established fintech businesses and incumbents alike making the integration of businesses somewhat complicated. This is due mostly to differences in business models, management and cultural differences and due to regulatory uncertainty. Financial institutions wishing to narrow the gap need also not linger on existing innovation but respond to or with newer innovations. Given the rate of adoption of financial technological advancements and the ever increasing investment therein as well as the perceived regulatory uncertainty one would argue that time is of the essence. Governments and industry regulators venturing to establish themselves at the pinnacle of this movement require regulatory guidance frameworks on fintech developments affecting the respective components within the financial sector. Some of these frameworks have been developed and implemented whereas others are still assessing the impact of fintech on the respective components of its financial system. 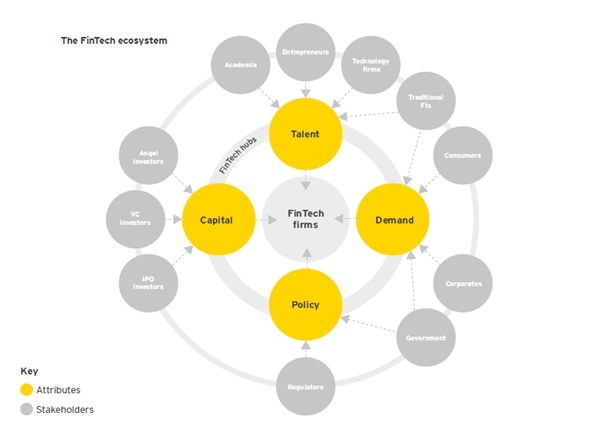 Fintech ecosystems have been important contributors to the development of technological innovation within developed markets such as the United States (US) and United Kingdom (UK). They enhance the broader local economy, enable growth opportunities within various sectors that include payment platforms, data analytics, software and algorithmic asset management systems to name but a few. Ecosystems are of vital importance as it nurtures technological innovation and enables financial markets to be more efficient. More so, it can stimulate the broader local economy. Establishing and nurturing fintech ecosystems are difficult as it requires collaboration between entrepreneurs, financial institutions and governments. Governments influence many aspects of such ecosystems including amongst others, general business regulations like copy right, company listings etcetera. Government involvement may vary however. Within the UK and US the private sector plays an important role and dominates the service provider landscape. This highlights that governments need not always directly stimulate such environments by financing it themselves, but at the very least need to create certainty within an environment in order to stimulate it. One of the foremost developed fintech ecosystems will be briefly described together with two examples of less matured ecosystems. When looking toward the integration of technology and its development over the African continent, understanding the South African ecosystem would be pivotal and would provide support for engagement on the topic. 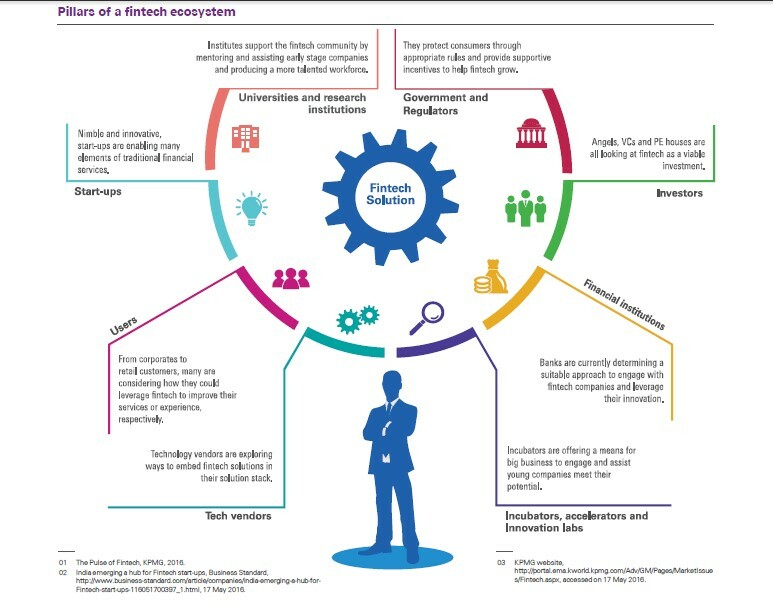 The four main pillars which contributes to the development of a well-functioning fintech ecosystem within the UK was identified as the availability of financial services, technical and entrepreneurial talent, the availability of financial resources for new entrants within the fintech market, government policy across regulation, tax and sector growth initiatives and end-client demand across financial institutions, consumers and corporates per illustration below. This discussion does not enable a complete discussion of all four fintech drivers. However the policy aspect which links to government and or regulatory involvement will be highlighted for this purpose. Much of the strength of the current policy climate within the UK is drawn from the supportiveness and accessibility of the Financial Conduct Authority (FCA), tax incentives and various government programmes intended to promote competition and innovation that directly supports fintech. In comparison to other developed economies such as Germany, the US and Hong Kong, the UK policy landscape was found to be open and less complex rendering it fertile ground for stimulating innovation within this area. This is obviously a single contributing factor to the other complimentary pillars which include its proximity as global financial hub, its access to appropriate talent and its facilitation of a successful network of so called fintech-hubs. With its clear intent on remaining at the forefront of fintech regions, it opted for a proactive approach as part of its agenda. The GCC countries which include countries such as the United Arab Emirates, Qatar, Saudi Arabia and Bahrain have recently ventured to establish more mature fintech ecosystems. Many financial businesses including banking, financial management, asset and wealth management are focussed on to provide benefits for incumbent financial services players as well as the users of financial services. The improvement of financial market efficiency and customer experience within the GCC countries are two critical drivers identified by government role-players and the private sector alike. As a means of developing an established and mature ecosystem the following four key design elements were identified as necessary. They include the business environment, governments, access to capital and financial expertise. One of the important pillars for purposes of this discussion is the role of governments. Governments determine the regulatory landscape within such an ecosystem. Where fintech environments are less-mature than developed fintech regions such as the UK and US, governments tend to fulfil a far larger role within establishing such an ecosystem as per the example below illustrating some responsibilities of a government of a less-matured ecosystem within the GCC. A country other than the UK and US developed markets that has successfully adopted such an ecosystem is India. The figure below illustrates the thinking behind the established ecosystem in India together with the most important pillars supporting it. Fintech partnerships established on this integrated basis connected expertise, technology and required experience for growth and market success. The value of the Indian fintech sector is estimated at approximately $33bn in 2016 with growth forecasts estimated to reach $73 bn in 2020 with its software market alone forecasted to reach an approximate $2.4bn by the same year. The Indian government has been identified as a catalyst for both failures and successes of fintech within the highly regulated arena. A multi-pronged approach was and is currently followed in order to provide funding for start-up fintech businesses, promoting financial inclusion and enablement as well as tax and surcharge relief. It furthermore promoted infrastructure support through its Digital India and Smart Cities initiatives attracting foreign direct investment. The Indian Government likewise provided funding for intellectual property (IP) related support patent or trade mark filings and other design work. The approach followed seems in line with that of developed fintech regions discussed earlier rendering its prospects of successfully competing with global counterparts in the foreseen future a realistic outcome. At a presentation at the Financial Advisory and Intermediary Services (FAIS) Conference during March 2017 Ms. Caroline Da Silva the DEO: FAIS and Consumer Education highlighted the need for joint sense-making and –giving within a rapidly evolving landscape such as this and posed the question as to whether existing regulatory frameworks would be sufficient as and when such new innovations would emerge. 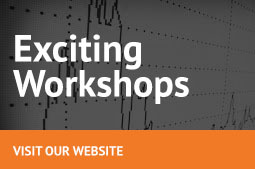 South Africa has a vibrant financial system highly regarded worldwide. As a prospective mature fintech market, form a regulatory perspective, private sector involvement and state efficiency is just as important as a legislative or regulatory framework that encourages market entrants and existing business. There have been recent fintech activities which shows signs of the level of maturity within the South African context. 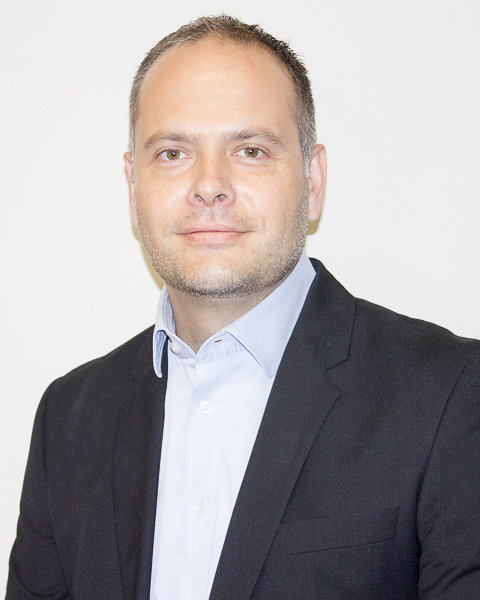 The first global borderless credit model developed by a relatively young fintech platform, Prodigy Finance (established 10 years ago) raised approximately R3.19 bn with help from the venture capital firm Index Ventures in conjunction with Balderton Capital, AlphaCode (the fintech investment arm of Rand Merchant Investment Holdings) and a global investment bank. Its CEO Cameron Stevens comes from Cape Town but headquartered the company within the UK expanding its operations to subsidiary locations in New York and Cape Town rendering it as one of the leading developments in international fintech. Concerns are however that much of the talent and innovation is drained from South Africa due to a less-mature fintech ecosystem creating the possibility that innovation may end up in markets that have taken the development of a mature ecosystem more serious. Given the examples of both mature and less mature ecosystems one considers that the requisite drivers are available to be not only the driver of fintech on the African continent but to become a global influence within the sector. The importance therefore of both governmental and regulatory involvement as a stimulus for clarity and innovation cannot be emphasised enough. Focus on creating regulatory guidance at the very least is a first step in the right direction. From a policy and regulatory perspective a well-developed fintech ecosystem would provide an equal footing for the required discussion on this rapidly evolving landscape going into the future. It would go a long way to stimulate discussion and hopefully as a consequence the development of both technology and regulatory understanding of activities falling within the broader understanding of fintech. More so where these frameworks could be connected to accelerator programmes or regulatory sandboxes that would, as seen in other mature ecosystems, function as a propellant within this sector. The end goal would be to create an environment that would optimise regulatory effectiveness for purposes of stability and protection whilst simultaneously not stopping good things from happening. IOSCO Research Report on Financial Technologies, 2017. Accenture LLP. Available at https://newsroom.accenture.com/industries/financial-services/growth-in-fintech-investment-fastest-in-european-market-according-to-accenture-study.htm. KPMG, Pulse of Fintech Report Q2 2017. EY Fintech Adoption Index 2017. Developing a fintech ecosystem in the GCC. Strategy&. 2015. Ernst & Young. Banking in Emerging Markets. GCC Fintech Play 2017. Fintech in India. KPMG. 2016. Previous articleWho can sell financial products in South Africa?